In the early 1900s aviation pioneer Glenn H. Curtiss was a key contributor to the development of the U.S Navy’s initial aviation program, including the first aircraft to launch from a ship. He invested much of his time and effort in seaplanes (aircraft fitted with floats instead of wheels or skids for landing gear) and his first seaplane designs, light, fast and maneuverable, were destined to become the most widely-built aircraft in the U.S. prior to the First World War. Curtiss named the amphibious craft the Triad standing for land, sea and air. However, the Navy later designated it the A-1. At the end of 1910, Curtiss established a winter encampment in San Diego to teach flying to Army and Naval personnel. At the encapment he trained Lt. Theodore Ellyson, who was to become the first U.S. Naval Aviator. The original site of this winter encampment is now part of Naval Air Station North Island and is referred to by the Navy as "The Birthplace of Naval Aviation." Curtiss introduced the Triad when he took the first flight on January 26, 1911, from North Island, flying at an altitude of about 800 feet. That day, with Navy observers present, he took off from and landed on the beaches of Coronado and waters of San Diego Bay. The Navy took notice and ordered Curtiss’ A-1, a virtually identical derivative of the Triad and the U.S Navy’s first aircraft. Delivered to the Navy that summer, it made its first flight with the Navy’s first pilot, Lt. Theodore Ellyson, at the controls on July 1, 1911. Thus the Triad was the first amphibious aircraft, the first plane to be launched by catapult, the first U.S. Navy aircraft to use an airborne radio, and the winner of many speed and endurance records. Due to the success of the aircraft, Curtiss was awarded the 1912 Collier Trophy, and also earned the title of “The Father of Naval Aviation.” The Triad/A-1 series later was sold to the navies of Great Britain, Germany, Russia, and Japan in 1912. In all, fourteen type A-1s were built, all with different options available. The Museum’s reproduction of the A-1 is the second one owned by the Museum. The first was lost in the catastrophic fire of 1978. This exact copy was built at Montgomery Field by the late Henry Hank Wheeler, with the assistance of 44 part time and three full time volunteers at a cost of $20,000. Construction took three years. 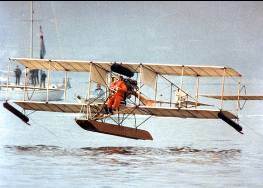 On January 26, 1984, Jim Dalby flew the A-1 over San Diego Bay just as Glenn Curtiss had done 73 years earlier. After the flight, Wheeler donated the reproduction A-1 to the Museum.